You're too old for Snapchat. So am I, in fact. Teens, on the other hand, can't get enough of the super short, supposedly secret messaging app. And it's teens that Seattle based startup Gemio is building smart jewellery for. "We've had about 50 kids test Gemio so far, aged from nine to seventeen and about 80% girls," Gemio's CEO and co-founder Michael Bettua told Wareable at CES 2016. "The girls, in particular, got excited about light messaging, which we underestimated in the beginning actually. They got us really thinking more of using light as the 'new Snapchat' if you will. It's a different way to communicate with your friends that no-one else knows." Gemio's line of $100+ social smart bracelets feature swappable gemsets that can be pre-programmed to light up in different patterns. For instance, when your friends are nearby or send you a message: "An inward whoosh, where the lights start on the outside and meet in the centre means a 'let's meet up' friendship message," said Bettua. "Or when friends are getting together, they can send a message to say they're thinking about it." 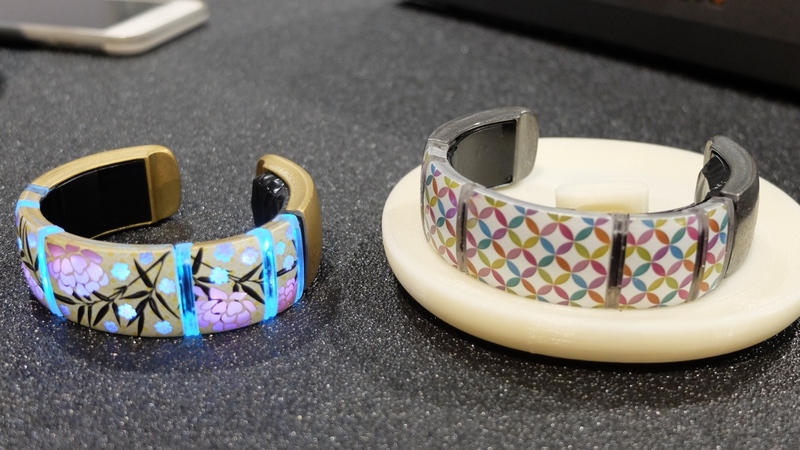 Gemio has packed quite a lot of wearable tech into the Bluetooth connected bangles which join Jewelbots and Linkitz in this emerging tech-accessories-for-teens category. An optical colour sensor means users can point the bracelet at what they're wearing and have the device automatically match the hue. There's an accelerometer and also a microphone so that the smart jewellery can light up in time to music. Its Design Studio app, currently in "rough alpha" allows kids to design their own gemsets and light patterns in a really easy drag and drop interface. Gemio has created a bunch of designs to get the community started and limited editions from "famous designers" are also planned. Bettua and his team are also expanding the Gemio app to include If This Then That integration to enhance the self expression potential for the bracelets. So if your favourite sports team wins a game, Gemio could light up in celebration. "Kids find that really exciting, to tie in the virtual with the physical," said Bettua. "At one point, we're going to be doing licensed gems so it might be a Manchester United gem set or a Star Wars gem set. At some point we'll have these branded gem sets. So when they light up based on certain events, it will be really meaningful to the kids." Like Snapchat, Gemio could succeed in offering teens a way to stay connected that's fun, doesn't require a lot of attention and looks super cute. Most importantly, it's essentially a secret language and who doesn't love a good code between friends, from imaginative nine year olds to cliquey teens? Gemio is up for pre-order now, starting at $100 and with discounts running until the end of January 2016. Shipping is set for June but stay tuned for an early look at a final production model in the next couple of months.